The 2013 ‘Come Fly With Me’ Charity Ball supported by Hamilton Grand, St. Andrews was held on Saturday 14th, December at the Concorde Hanger at Manchester Airport. The purpose of the evening was to raise funds and awareness to support the NSPCC, Help for Heroes and Leukaemia and Lymphoma Research. The evening began with James and his fiancée Amy welcoming their guests to a champagne reception with the wonderful backdrop of planes landing in keeping with the theme for the night. 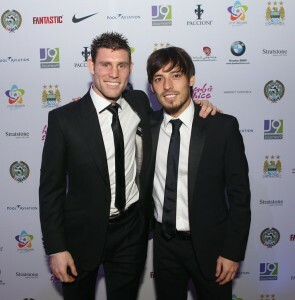 Many of James’ Manchester City teammates were in attendance to support the event including Vincent Kompany, Joe Hart, Micah Richards, Richard Wright, David Silva, Joleon Lescott, Javi Garcia, Jack Rodwell and Gareth Barry (on loan at Everton). Former Manchester City players who came to enjoy the evening and support the event included Patrick Vieira, Sylvian Distin, Danny Mills, Shaun Goater and Richard Jobson. Others in attendance from the world of football included James’ England colleague and Everton captain Phil Jagielka, Stephen Warnock and Neil Mellor. Guests entered the main arena to find the Concorde Hanger had been transformed into the ‘Come Fly With Me’ destination of New York at Christmas. The room included 2 Ferrari 458’s wrapped as NYC taxi’s, 20’ Christmas trees and large Nutcrackers as well as the James Milner Foundation logo lighting up the main Concorde plane. As guests took to their seats, girl band Voxe slowly appeared from Concorde singing the Jay-Z and Alicia Keys hit ‘Empire State of Mind’ to get the evening off to a fantastic beginning. Superb hosts Jonny Gould and Sky Sports News’ Hayley McQueen took to the stage and set-up the evening. Karl Michael from the BBC’s talent show The Voice was next up and gave an amazing thirty-minute acoustic set. After dinner, leading football freestylers The F2 took to the dance floor to give another virtuoso performance in synchronised football tricks and skills. Jonny Gould then reverted from his role as host to hold an amazing main auction raising tens of thousands of pounds for the three main charities. After the fund raising was complete, chart-toppers Lawson returned to play again after a hugely successful year performing their catalogue of hits. Once again blowing away the audience and the 600 plus guests to surround the main stage. The last act of the evening were X Factor runners-up and multi award winning boy band JLS. Having completed a sell out show earlier in the evening at the Phones4U Arena as part of their farewell tour, Marvin, Oritse, JB and Aston rushed across Manchester to perform an exclusive set that rocked the crowd. Continuing the New York theme of the night, a large marquee opened for guests to visit a parallel Central Park with Christmas trees, fake snow, an ice-skating rink, dodgems, hot dogs, horse chestnuts and pretzels. The finale of the evening was Marbella Sessions DJ Colin Francis hitting the decks for the after show party that went on well into the early hours of a spectacular night.